Custodial managers from school districts, colleges, universities, cities and counties gathered last week in Addison to network, increase their leadership skills, learn about new technology, see available vendor equipment and supplies and share best practices. 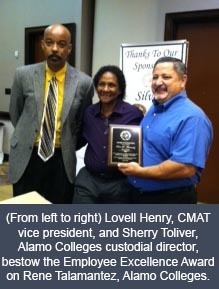 The Custodial Management Association of Texas is geared strictly toward the custodial profession. 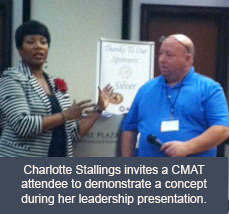 Speakers Charlotte Stallings and Arthur J. Johnson spoke on leadership, exemplifying the conference theme, Custodial Leader, Past, Present and Future. CMAT members led break-out sessions on topics such as regulatory compliance for fire alarm testing, gas pressure testing and playground safety. Although the organization focuses on custodial services, members and conference participants include individuals who may also be responsible for other areas, such as safety or maintenance and operations. Bobby Davis, Rice University, and current CMAT president, and James Dodson, Montgomery County, and secretary treasurer, invited custodial services managers to mark their calendars for next October 2015 when CMAT will celebrate its 37th year at a conference in San Antonio. There were nearly a dozen vendors exhibiting at the conference including Choice Partners national purchasing cooperative and two Choice Partners vendors -- Tandus Centiva and Buckeye Cleaning Center. Choice Partners provides legal, competitively awarded government contracts for school districts, colleges and universities and other government organizations to use to procure facility services, carpet maintenance and janitorial supplies and equipment. In addition, the unique supply catalog includes hard bids for best pricing with specific quality parameters for mop buckets and mop bucket wringers; plastic bags; laundry detergent; hand soap; disinfecting wipes; personal hygiene products; absorbent; toilet tissue; facial tissue; towels: cloth, multi-fold paper, single-fold paper, and paper roll; trash containers and wastebaskets. 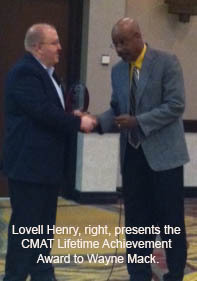 For more information, visit www.ChoicePartners.org or call 877-696-2122.